Oats are a staple most cooks cannot live without! How many other whole grains pack as much healthful variety into their product? 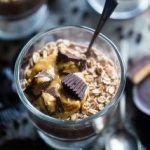 The thing I love about oats is the fact that they can be customized in so many recipes from breakfast foods, baked goods, healthy snacks, and even used in place of bread crumbs when making things such as salmon patties or meatloaf! I wanted my students to see, taste and appreciate the goodness that oats have to offer so when I saw a YouTube ad by Quaker Oats promoting an oats contest, I knew how I wanted to incorporate this information into my grain unit. However, if you don’t teach a unit specifically about grains, no worries as this can easily be incorporated into a breakfast or healthy snack unit!